Van and Heather Puckett took a chance on leading a self-sustaining agricultural life with just 160 acres and a dream. What they lacked was farming experience and resources to point them in the right direction. Pigs are exactly where they started. Van and Heather moved their seven children to Heather’s parent’s homestead, located on the irrigated benchland property at the base of the Tobacco Root Mountains, about 10 miles outside of Twin Bridges, and acquired a few pigs. “We bred and raised them and worked with L&S Meat Processing, a small, family-owned local butcher, to sell meat to those who were interested in a better-tasting, responsibly raised product,” Heather says. Things were going well, so the Pucketts expanded and purchased a small herd of ill-fated goats. The family was interested in farming, but they were in search of resources that would help them learn to be better caretakers of their animals and stewards of the land. It was by happy accident that the Pucketts were introduced to the Armed to Farm program, veteran- targeted agriculture workshops put on by a partnership between the Montana Department of Agriculture (MDA) and the National Center for Appropriate Technology (NCAT). Van has served in the Army Reserve since 2007 and was directed to the Armed to Farm program while at drill one weekend in 2016. The Pucketts attended a workshop later that year and built several connections. The Puckett’s MT Cross Farms worked with the U.S. Department of Agriculture’s Farm Service Agency and Ruby Valley Bank in Twin Bridges for financing, and with help from NCAT to develop a grazing plan, they now raise Icelandic sheep – 150 ewes and their offspring, two whethers, and eight rams – for meat and fiber. 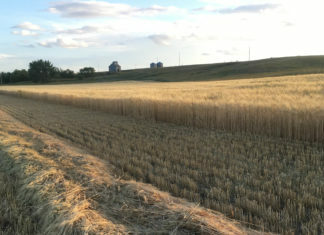 The Armed to Farm program began in Montana in the summer of 2016 when the MDA partnered with NCAT and applied for funding from the USDA’s National Institute of Food and Agriculture’s Beginning Farmer and Rancher Development Program. The program has three main goals: to train veterans and their partners to operate sustainable farms; to create a network of veterans and their families embarking upon careers in sustainable agriculture; and to provide technical assistance to participants as they improve their farming operations. NCAT has been involved in targeted veteran outreach and assistance since 2010. The aid is funded through NCAT’s sustainable agriculture program and USDA Rural Development in addition to other outside grants. “We raise funds so that there is little to no cost to the veterans attending the trainings,” Howard says. NCAT’s agricultural specialists provide expertise at workshop sessions, lead hands-on training on farms and provide technical assistance after workshop events. In Montana, NCAT partners with the MDA to provide information on resources that are available from the state including the Food and Agriculture Development Centers, the Growth Through Agriculture program and Food Safety Resources. Farmers who attend are provided five-day intensive training at no cost. Feedback from the participants has been overwhelmingly positive. About 96 percent of participants say they would recommend the program to other veterans. The Pucketts are preparing for Van’s next mobilization and will rely on Armed to Farm. Howard adds, “The bonding that happens between the participants is one of the most important things we see,” noting that support is one of the program’s most beneficial aspects. Farver Farms diversifies its operation with dry mixes.